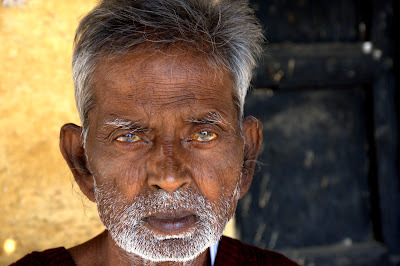 I've been in Varanasi, India, for just two weeks today, and for 10 of those days I've been fairly sick. Nothing dramatic, but not all that pleasant, either. I started out with a stomach bug, followed by flu and cold symptoms, which turned into a chest infection, which was followed by another round of stomach problems. After an antibiotic, now I just have a lingering cough. Is this even worth writing? I have some stories backing up that need more attention than I can muster right now, so I'll fill you in on them later. I've been reunited with so many friends here, some of whom are neither lepers nor prostitutes, that it takes time to walk down the lanes to get a meal. The children are as beautiful and dirty as ever, and my heart breaks, or breaks open, with a wonderful regularity while spending time here. It's easy enough, and tempting, to close down to the poverty and despair that is the foundation for so many lives of the poor. It's really only painful if you care. But open those doors of compassion, and watch out. It's just too much to take in some times. I was sitting with my friend Julianne at a chai stand on the stone steps (called ghats) next to the Ganges river, when a woman in her late-thirties came and stood in front of us. You get used to beggars here, and they range from the truly destitute to the needy-without-alternatives to mafia-managed professional beggars with their rented babies. You can never really be sure who is who, though it's tempting to think otherwise. But this woman stood in front of us as still as a pool of water. She wasn't dirty, like many of the beggars, and she hardly indicated that she was begging. But she had an expression like she wasn't used to this, and if there was any other path she could possibly take, she would. She seemed vulnerable, too, in a way that was unsettling when you're used to the faux drama that most beggars employee. 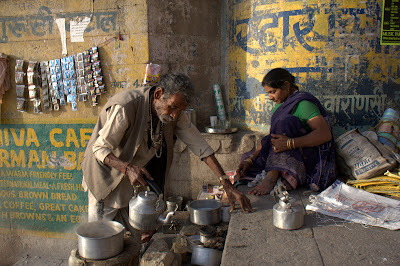 We didn't give her anything, but the chai vendor gave her tea and a biscuit. A very sweet young guy approached us about renting a boat, and we asked him to talk to the woman about her situation. It turns out that she'd recently lost both her husband and her child, and she'd come to Varanasi four days earlier because she didn't have family and didn't know where to go to or what to do. She started really crying hard, and it confirmed all our suspicions about her vulnerability and insecurity. I asked Deepu, the boat man, some questions for him to translate, and he said he didn't want to ask her, because she was crying too much. He said, "Before, she not thinking about her husband. Then I ask, and now she crying. Better I should not ask more. This woman, she's like my mother." Deepu told her where he keeps his boat, and offered to watch out for her. We gave her a pathetic $2 donation, which is almost too much to just hand someone on the ghats - 5 cents to 20 cents is more typical. But after Deepu's care and our obvious interest and attention, she smiled in a way that showed that she dared to hope that things might improve. We saw Deepu the next day and he'd given her a blanket, since she's sleeping outside. I thought for sure she'd come at sunrise again to see if we'd give her more money, but we haven't seen her yet. Hopefullly we will tomorrow. What's an appropriate response is the face of such despair? I have no idea. I'm happy that I still open myself to these kind of experiences, and I also hope that I'm not "collecting" them for the sake of story-telling. Would it be better or worse if I didn't write about them? Boy, there are so many things I don't know.